Taking a day trip around the lake or looking for an evening out, we are your one-stop destination! We offer great food, top customer service, live bands every weekend and lakefront lodging. You can join us by land or by Grand and will treat you to great food, delicious cocktails, live music and a sunset view that will take your breath away. Mooney's Sunset Bar & Grill is an iconic feature on Grand Lake and has 30 years of history rocking this island we called Disney Island. Whether you're in the mood for an exciting day of dancing and cocktails or just want a relaxing stay on the lake...look no further...Mooney's stands out from the rest with our full Cocktail and Grill menu and completely remodeled rooms that each offer a unique waterfront view. Perfect for weekend getaways or just a well deserved midweek break. Our rooms are spacious, complete with all amenities, luxurious pillow top mattresses and plush linens. Hungry? We have you covered. Join us for the BEST burgers on Grand Lake O' the Cherokees. Our Famous Mooney's burgers are a mouth full with a half pound of meat seasoned and grilled to perfection piled with fresh vegetables just the way you want it. Each basket comes with fresh cut fries or your choice of sides. 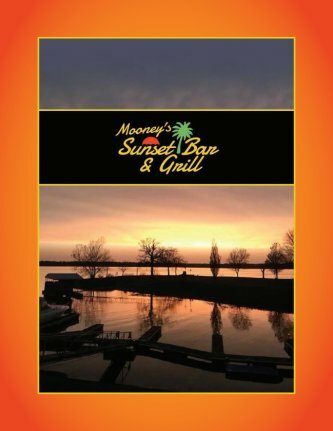 Mooney's Sunset Bar and Grill offers a full service bar with all of your favorites on hand. From mixed drinks and cocktails to your favorite ice cold beers, one of our experienced bartenders will be happy to help quench your thirst.